Exhibiting for the first time in the UK, Hamiltons presents Italian photographer Benno Graziani's iconic black and white and colour images from the legendary, glamorous glory-days of the rich and famous, spent on the French-Italian Riviera in the fifties, sixties and early seventies. Graziani, a world-renowned photographic journalist, was one of the original staff at Paris Match along with Willy Rizzo and Daniel Filipacchi under the directorship of Jean Prouvost and Hervé Mille. Prouvost, who led Paris Match to attain such high prestige and financial success, encouraged the young photographers to âspend what you want' and âlive like kings' on the condition they produced quality images. âMatch was our little club, there were no editors meetings because we hardly spent time apart from each other  and it worked! Some editions sold more than two million copiesâ¦very quickly we were the best. The worlds press envied us and tried in vain to imitate us.' Graziani. 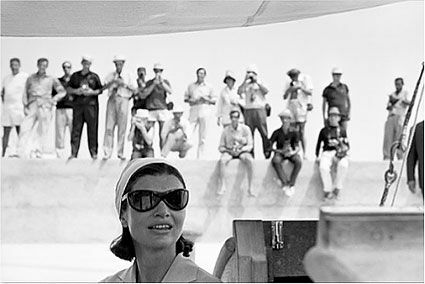 Graziani was friends with some of the biggest stars of his era, including Jackie Kennedy, who invited him on a holiday she took with her sister to Ravello Italy, in 1962. There he enjoyed the delights of the good life with them, swimming, boating and waterskiing; there was no timetable, there were no bodyguards and even the paparazzi were discreet. As one of her closest friends, having met as journalists whilst Jackie was working for The Washington Times Herald in the early 1950s, Graziani had the privilege of witnessing and documenting the Kennedy's lifestyle on an intimate level as seen in his book Benno Graziani: Collection Privée, Les Années d'or d'un Grand Reporter, published by Editions Verlhac, October 2008. âShe (Jackie) began as a reporter-photographer and led a truly exceptional life, a fairy tale transformed into Greek tragedy, Perrault as seen by Aeschylus, marked by glory and tragedy. Today she is part of history.' Graziani. Similarly intimate documentation can be witnessed between Graziani and a host of stars including Kirk Douglas, Charlie Chaplin, Audrey Hepburn, Jane Fonda, Brigitte Bardot, Princess Grace of Monaco and Ursula Andress amongst others. âThere are people who make history, those who endure it, and those who tell about it. That's me.' Graziani. A few lines cannot do justice to the wealth of stories and colourful experiences Graziani has covered throughout his career. He was an inspiration for Fellini's La Dolce Vita; his work is held in numerous high profile collections and has been exhibited internationally at The Metropolitan Museum, New York, 2000; Musee des Arts Decoratifs, Paris, 2001 and Galerie Photo 12, Paris, 2007, amongst others. âIf I am no longer famous, I was famous for several hours or days when my big articles were published in Match and picked up by other international magazinesâ¦a long time ago.' Graziani.